At the sheep sale on Saturday, January 19th 2019 there was a livelier trade from the previous sale. 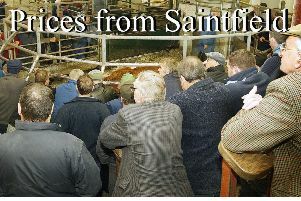 Hoggets sold to £110.00, fat ewes sold to £100.00 and light weight lambs sold to £4.25ppk. Legamaddy farmer 31kg, £110.00, Downpatrick farmer 26kg, £100.50, Ballynoe farmer 24kg, £100.00, Killough farmer 24kg, £98.50, Hillsborough farmer 24kg, £96.00, Clough farmer 27kg, £96.00, Aughlisnafin farmer 24kg, £94.50, Kilkeel farmer 22kg, £94.50, Tullymurray farmer 23kg, £94.00, Ballynahinch farmer 23kg, £93.00, Jonesborough farmer 21kg, £91.00, Teconnaught farmer 21kg, £89.00, Kilkeel farmer 20kg, £80.00 and Newry farmer 19kg, £80.00. Downpatrick farmer £100.00, Saintfield farmer £80.50, Ballynahinch farmer £80.00, Ballyrolly farmer £80.00, Loughinisland farmer £70.00 and Castlewellan farmer £60.00.